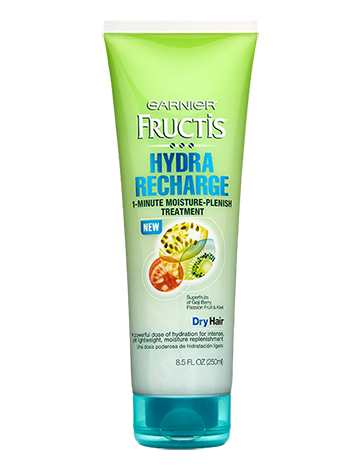 I recently received a sample of the Garnier Fructis Hydra Recharge Shampoo, Conditioner and 1-Minute Moisture-Plenish from PINCHme free-of-charge for review. The Hydra Recharge line promises "weightless, silky hair for up to 2 days" and is geared towards normal to dry hair. For the record, I have thick, dry and frizzy hair, so I was really interested in this line. 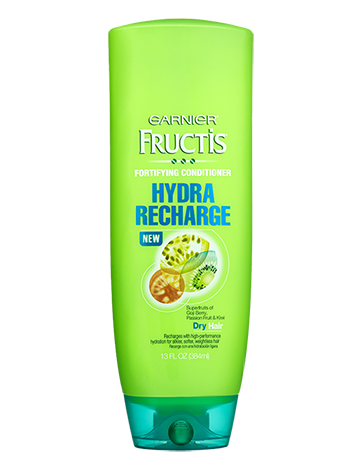 Hydra Recharge is the first shampoo with encapsulated beds of superfruit goji berry, plus passion fruit and kiwi. Hair is ultra-hydrated, weightlessly silkier and softer. I wasn't a fan of the beads. I found them unnecessary and kind of bothersome, and I'm not sure whether they do much for the hair that the translucent shampoo base doesn't already do. However, of the three products I sampled, I liked the shampoo best, just as I did with the Dove Oxygen Moisture line. It isn't often that I like a shampoo because they are typically too drying or heavy for my oily scalp, but this one was the perfect balance of cleansing and hydrating. 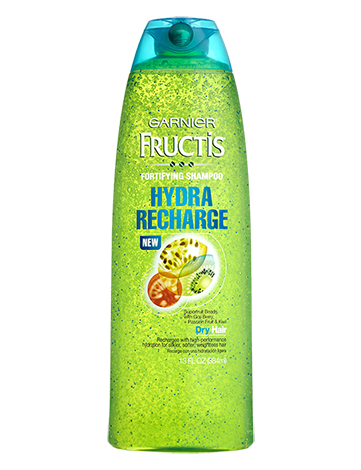 It had a really delicious fruity smell, closer to Skittles or fruit candy than previous Garnier Fructis hair products I've used (which have had a light apple or banana scent). The hydrating conditioner with superfuits of goji berry, passion fruit and kiwi, actively replenishes moisture without heaviness. The conditioner was a light blue opaque color, and surprisingly thin for a hydrating conditioner. Going on, I felt my hair immediately take on a smoother texture, but after my hair dried, it fluffed up as much or more than usual. The scent wasn't as fruity or candy-like as the shampoo, and had a slightly more synthetic smell to it. Experience a powerful new blast of hydration. Hydra Recharge 1-Minute Moisture-Plenish Treatment's powerful yet lightweight crème-gel formula, with superfruits of goji berry, passion fruit and kiwi, delivers a surge of high-performance hydration in just 1 minute. Hair is ultra-hydrated, weightlessly silkier and softer. I did not use this independently from the shampoo and conditioner combination, but I have tried the shampoo and conditioner without the 1-Minute Moisture-Plenish (which you are supposed to leave in your hair for a minute after conditioning your hair). I did not notice a significant difference between using the 1-Minute Moisture-Plenish and not using it. Like the conditioner, the Moisture-Plenish had a slightly synthetic smell to it and it wasn't noticeably different in texture or color from the conditioner either. As of now, I am not seeing much of a point to the Moisture-Plenish and on principle, it seems redundant to need to apply a treatment on top of your conditioner. Overall, I really enjoyed the shampoo and would repurchase it. I'd probably give the conditioner another go, though I think there are better conditioners out there that give thick, dry hair better hydration. As with most (if not all) so-called "hydrating" shampoos, conditioners and hair treatments, these all contain some form of silicone in them, which can ultimately be more drying than hydrating to your hair.